We reported earlier that on January 6, 2010, ground-based observatories may have spotted evidence of an asteroid collision in the asteroid belt. 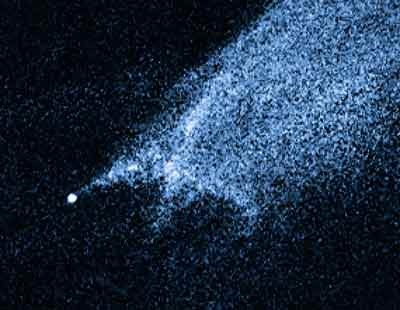 Now, the Hubble Space Telescope has taken a look at the mysterious X-shaped debris pattern and trailing streamers of dust. With Hubble’s sharp vision, astronomers believe a head-on collision between two asteroids has actually occured. Astronomers have long thought the asteroid belt is being ground down through collisions, but such a smashup has never been seen before. Asteroid collisions would likely have an average impact speed of more than 11,000 miles per hour, or five times faster than a rifle bullet. 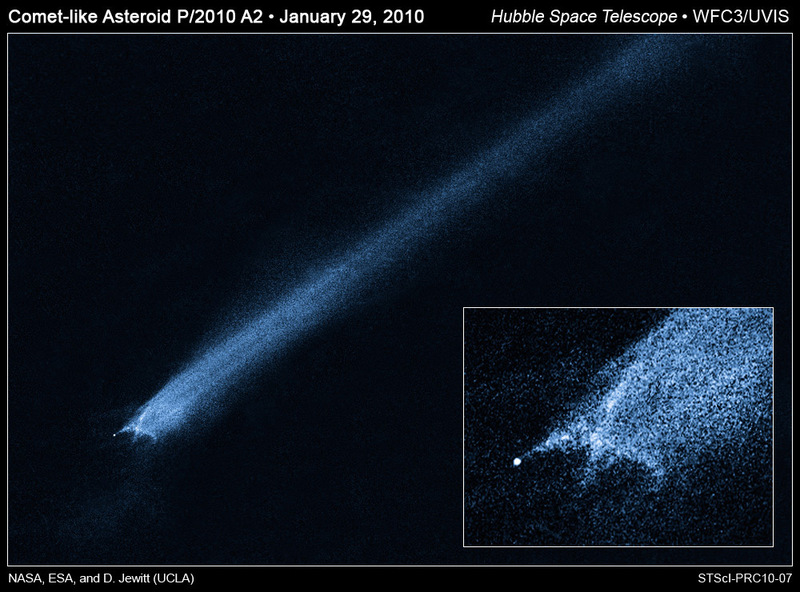 The comet-like object imaged by Hubble, called P/2010 A2, was first discovered by the Lincoln Near-Earth Asteroid Research, or LINEAR, program sky survey on Jan. 6. New Hubble images taken on Jan. 25 and 29 show a complex X-pattern of filamentary structures near the nucleus. Normal comets fall into the inner regions of the solar system from icy reservoirs in the Kuiper Belt and Oort Cloud. As a comet nears the sun and warms up, ice near the surface vaporizes and ejects material from the solid comet nucleus via jets. But P/2010 A2 may have a different origin. It orbits in the warm, inner regions of the asteroid belt where its nearest neighbors are dry rocky bodies lacking volatile materials. “If this interpretation is correct, two small and previously unknown asteroids recently collided, creating a shower of debris that is being swept back into a tail from the collision site by the pressure of sunlight,” Jewitt said. “The filamentary appearance of P/2010 A2 is different from anything seen in Hubble images of normal comets, consistent with the action of a different process,” Jewitt said. An impact origin also would be consistent with the absence of gas in spectra recorded using ground-based telescopes. I for one welcome our future alien overlords! LOL! Two good ones in a row! Hopefully Hubble and other scopes were able to obtain infrared spectra of the debris clouds to give us some clues as to composition and physical conditions. To my mind this raises a question on whether there is some critical mass of an asteroid belt for it to coalesce into a planet. Maybe below that critical mass the asteroid belt smashes itself int bits instead. would love to see a 3d modeling as Surak notes. is this something they would normally do? Lawrence’s comment also interesting/thought provoking. Any chance Cassini, MRO, Mars Express or New Horizons could image this? Any of the comet/asteroid missions? New Horizons and Cassini are further away from it than we are (the former is halfway between Saturn and Uranus now). MRO and Mars Express aren’t designed for looking up. Whats the bright spot at the 9 oclock postion?